There are many benefits related to teaching children how to grow their own garden. Not only will they witness the value of hard work, but they will personally benefit from the resulting rewards. One way to encourage children in their gardening habits is to choose a garden theme, such as a pizza theme. This is sure to become a favorite theme for any child - and adult! This article will cover four ideas for pizza toppings which can be grown in a garden. Of course you can come up with your own ideas as well. Tomatoes are easy to grow and are especially fun to watch grow. Your child will see the plants start off as a transplant (buying from the store is easiest), grow taller and begin to produce green fruits. They can then watch them turn into ripe red tomatoes which are always exciting to pick. Space the tomatoes about 3 feet apart, if possible, in your garden. The more room you allow between each plant, the easier it will be to walk around and find the fruit. As a note, the tomato is technically a fruit - not a vegetable. Dig a hole and remove the bottom few leaves in order to allow the stem to be planted deeper in the ground. The deeper it can be planted, the better. Once planted, water the soil to allow it to settle into place. Water regularly keeping the soil moist, but not soggy. Therefore, make sure there is sufficient drainage for the water to disperse underground and thereby not creating a puddle. 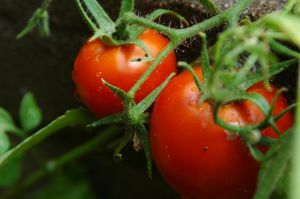 Tomatoes love lots of sun, so choose a location which is not in the shade. Only plant the tomatoes when the last signs of frost have passed. Use the tomatoes to create your own pizza sauce, or use them as a topping. If using them as a topping, choose meaty tomatoes, such as Roma tomatoes, which do not have a lot of tomato juice which can cause the top of the pizza to become overly soggy. Just like the tomatoes, buy the bell peppers as small plants from a nearby nursery or home improvement store. Begin planting once the last signs of frost have safely passed. 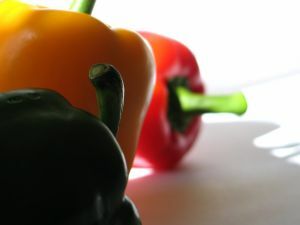 Peppers come in a variety of colors from green, to red, to even purple. Plant the pepper plants approximately 2 feet apart and in warm soil where there is plenty of sun. These will grow at least a foot in height. Water regularly, especially in the beginning weeks. Red and green bell peppers are essentially the same vegetable. A sweet green pepper is simply a pepper which has not fully ripened. Either will go great on a pizza as a delicious and nutritious topping. You can thinly slice them or chop them into 1/2 inch squares. Each bell pepper will give its own unique flavor to the pizza. These can be banana peppers, jalapenos peppers, or other variety. These are great for those who like more of a bite to their pizza. Banana peppers are a good middle of the road pepper which adds a mild, but still noticeable spiciness. 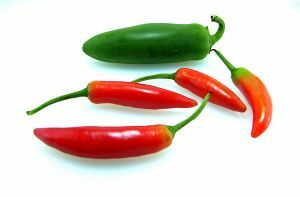 Plant hot peppers the same as the green or red bell peppers above keeping in mind not to over water the soil. Peppers tend to do best in warm soil which is just a little dry. They require full sun at least 6-8 hours a day - the more the better. Slicing hot peppers are a good way to prepare them as a topping. This allows a person to easily remove them from their pizza if they prefer to avoid eating them. Basil is an herb which is easy to grow, and is frequently used on Italian pizzas. Just a simple combination of tomatoes, basil and fresh mozzarella cheese can make what is called a Margerita Pizza, named after one of the Queens of Italy during the 19th century. Plant basil near the tomatoes so they are within easy reach of each other. Basil enjoys full sun, but can survive in partial shade. Buy the basil as transplants from a store and plant only when the soil is consistently above 70 degrees F. This herb is very sensitive to any cold weather and will have a difficult time surviving if it is too cold. Space the basil plants 12 inches apart leaving room for root growth and thus preventing any overcrowding. Keep the soil moist and water when it is dry. 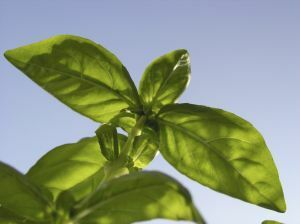 As mentioned, basil can be used on a pizza by simply tossing on a few torn leaves during the last 4 minutes of cooking. However, you can also create a pesto with the basil, by using a food processor to blend the basil, olive oil, garlic, salt and pine nuts (if available). Once it is well blended after a few pulses, simply spread over the pizza, or drop randomly as a separate topping. Growing a garden can extend beyond these pizza toppings. It can include other vegetables and fruits such as zucchini, lettuce and cucumbers - all perfect choices for a nice summer salad. Have fun and experiment, choosing a few new food items to grow such as watermelon or even strawberries. For most children a big slice greasy of pizza is their favorite type of food, whether for parties, or a Friday night dinner. By growing their own garden to create homemade pizzas with lots of vegetables, a child can learn that healthy eating and cooking can not only be fun, but also personally rewarding. So get your kids in the garden growing their favorite pizza toppings. This article was contributed by Liz Krause, publisher of a cooking website. She enjoys writing about various topics related to Italian cooking including reviews and advice for kitchen appliances from a pizza dough mixer to those looking for fun gelato makers. She lives in Virginia with her husband and spends her free time grocery shopping or cooking. Do you have a great kids garden idea? Please share your comments and ideas! Do you have some pictures or graphics to add of your kids garden? Great! Click the button and find the first one on your computer. Select it and click on the button to choose it.